Trading to Win - Stock Market Views and Trading Ideas based on the mix of Technical Analysis and "Funny-mentals" by DavidDT using Tom DeMark Indicators Trading to Win: Which Way Now? I do not have the answer to that any more than the rest of you do. :-) The news doesn't matter? I guess that can be put to rest now for awhile. While I'd like to think the news doesn't matter, when it's orchestrated so flawlessly as it has since March 6, 2009, I can't make that claim so often cited by technical traders. You didn't get the advantage of "seeing" that coming, no matter what your charts looked like. So you want to be a swing trader? Good luck with that, because this is completely out of control in a hand-basket. /end of my editorial or I'll start discussing things we don't dwell on here at TTW. We pick up, settle down and plan for the next day as best as we can with one eye over our shoulder. 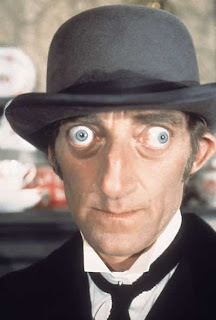 Just make sure you adopt Marty Feldman's view as best as you can and look both ways. Now, finally I’d like to say what a pleasure it is to trade alongside of all of you every day, and particularly on days like this. You are a unique, intelligent, polite group of human beings that I am proud to trade with day in and out no matter the outcome. Keep your peepers open tomorrow and trade carefully. The fat lady hasn’t sung yet. I'm reading: Which Way Now? $$Tweet this!